A missing tooth can be a major source of embarrassment, especially when the resulting gap is right in the front of a smile. But did you know that missing a tooth – even a molar in the back of your mouth – can also affect your overall health? Replacing missing teeth is about more than improving one’s outward appearance – it is also important to maintaining a healthy lifestyle. Keep reading to learn how dental implants in Collierville can benefit your overall health. Gaps can encourage tooth movement – If you have a gap in your mouth from a missing tooth, the adjacent teeth may move or drift into the empty space. This may not seem very significant, but when teeth move out of their normal position they can be more difficult to properly clean, resulting in a higher risk of tooth decay and gum disease. Don’t ignore missing back teeth – Some people may be tempted to forgo replacing a missing tooth if it does not affect their outward appearance. 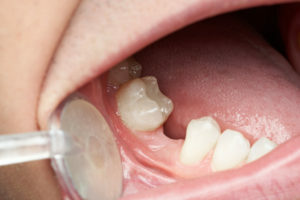 However, missing a tooth in the back of the mouth can negatively affect your bite by placing extra force on the front teeth and can eventually affect jaw function. Early replacement of lost back teeth can prevent the front teeth from moving or cracking and chipping. Missing teeth affects what you can eat – Eating a balanced diet is key to maintaining overall good health, but it can be difficult to consume all the right foods if you are missing one or more teeth. Tough foods like meat require a lot of chewing with the back teeth, while front teeth are necessary to bite into a crisp, whole apple. Having a full set of teeth means you can choose from the full menu or market shelves without worry. A dental implant is a titanium rod that fuses with the natural bone in the jaw to provide a stable base for a new crown, bridge or denture. By mimicking natural tooth root structure, dental implants are the strongest devices available to support single or multiple teeth replacement. Dental implants feel and function like natural teeth and can restore the ability to eat, speak and smile with confidence. Stable, comfortable, and natural-looking dental implants can restore your confident smile and preserve your overall health. For more information regarding dental implants, talk to a dentist in Collierville today. A graduate of the University of Tennessee Health Science Center in Memphis, Dr. Joshua A. Holcomb offers comprehensive dentistry services right in the heart of Collierville. Dr. Holcomb’s commitment to excellence sees him complete over 100 hours of continuing education each year, helping ensure his patients receive the best oral care with the latest knowledge and technology available. If you want to discuss options for replacing missing teeth with Dr. Holcomb, visit his website today or call the office at +1 901-850-0300.